Samsung DV457EVGS 7.5. Cu. 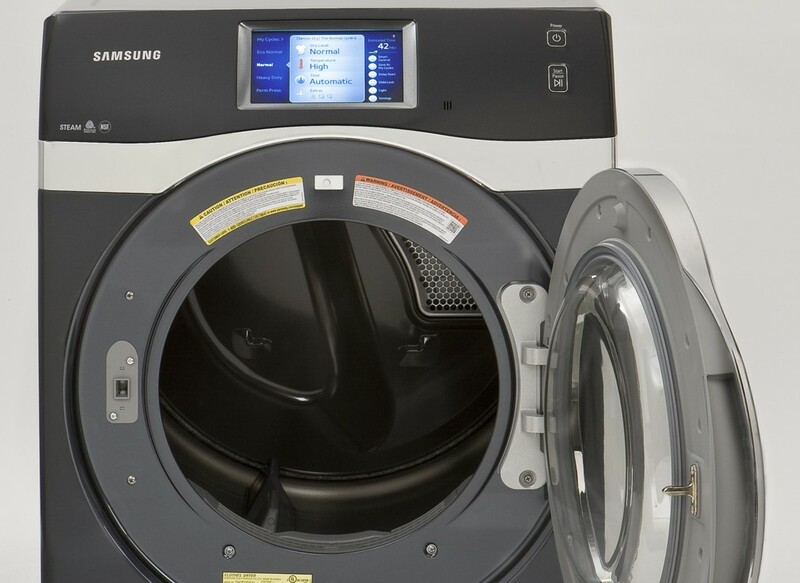 Ft.
Over the past several years, Samsung has introduced a full line of various laundry products. 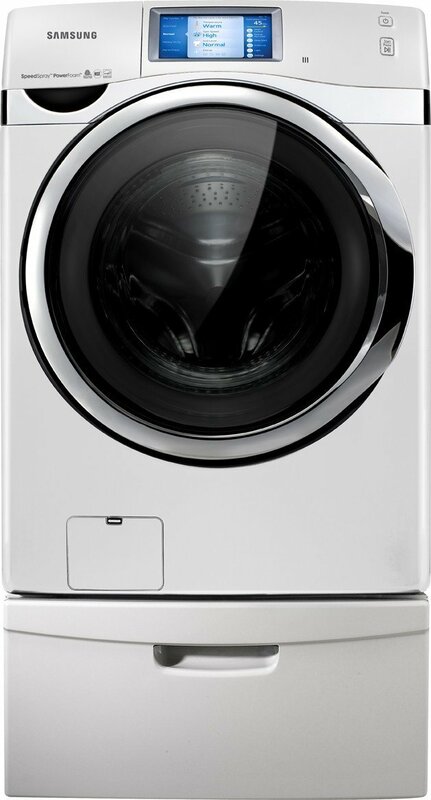 Samsung DV457EVGS has great features that help freshen the clothes and remove odors and wrinkles. This appliance is anything but a simple household dryer. 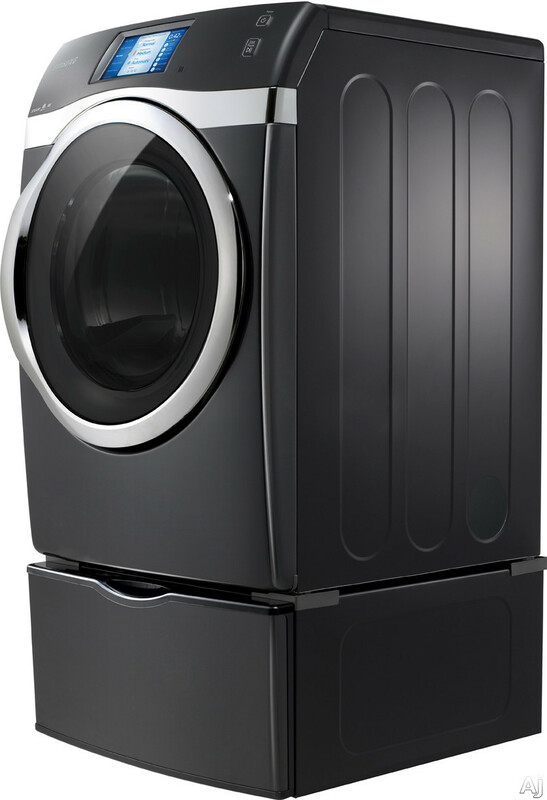 It’s iron, clothes dryer, fabric freshener, fabric steamer and more all in just one unit. It has sensors for measuring moisture, meaning that your clothes won’t be over- or under-dry. All the features offered by this dryer are brought together by an amazingly designed user interface that makes this dryer easy and convenient to use. Weight: Product Weight: 125.6 lbs; Shipping Weight: 134.4 lbs. Capacity (cu.ft. ): 7.5. cu. ft.
8″ TouchScreen LCD – easier and faster way to control its functions. Great capacity of 7.5 cu. ft.
Smart Care – instant and convenient troubleshooting for your appliance with Smart Care. Smart Control – controls and monitors the dryer from your Smartphone. The dryer notify your smartphone when laundry is finished. Steam Dry Technology refresh the clothes, making them wrinkle- and odor-free. 14 Drying Cycles explained below. Door Safety Lock prevents the dryer door to be opened by a child. Drying Rack is a mode that uses a rack for tumble-free drying of sweaters, sneakers and other garments. Drying Programs: Steam Refresh (Steam Dry), Eco Normal, Heavy Duty (Sensor Dry), Bedding PLUS, Wool, Air Fluff, Sanitize, Active Wear, Quick Dry, Time Dry, Delicates (Sensor Dry), Permanent Press, Normal (Sensor Dry), Steam Wrinkle Away. I couldn’t find any video related to this Samsung appliance. The innovative smartphone app lets you start the dryer and select the cycle, drying time and temperature from anywhere through a wireless network. Comes with a nice and stylish design. Has a reversible door that can be changed to open from the right or left, for easy access. Set of cycles and methods for different fabrics and garments. The lack of a towel cycle might be a drawback for many people. 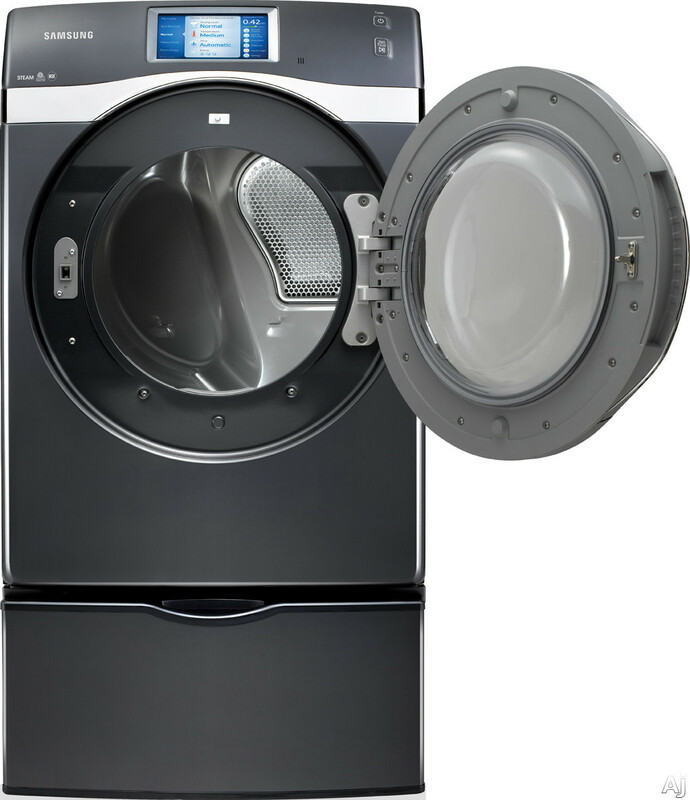 Some dryers might require a major commitment when it comes to servicing or repairing. Samsung follow a simple, yet successful business philosophy: they devote their talent and modern technology in order to create superior products. Samsung DV457EVGS has 8” LCD touch screen and is controlled with Smart Control. As with any other smart dryer on today’s market, you’ll have to pay extra money for smart features. But, don’t worry; the energy-efficiency will save you some money in energy bills. The lack of towel cycle is pretty big drawback for me, but if that’s okay with you, then you should opt for this dryer.